WEIS 2009 will be held at University College London, England. 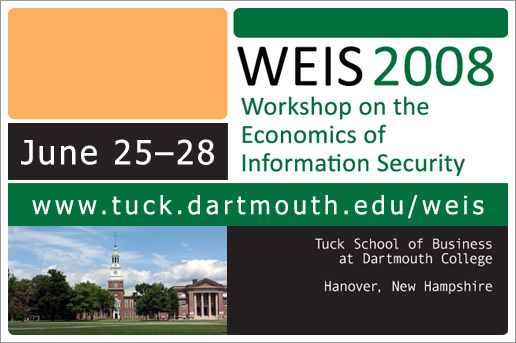 WEIS 2008 was hosted by the Center for Digital Strategies at Dartmouth College's Tuck School of Business, in partnership with the Institute for Information Infrastructure Protection (I3P), which is managed by Dartmouth College. The workshop took place June 25-28, 2008 in Hanover, New Hampshire. Information security requires not only technology, but a clear understanding of risks, decision-making behaviors and metrics for evaluating business and policy options. How much should we spend on security? What incentives really drive privacy decisions? What are the trade-offs that individuals, firms, and governments face when allocating resources to protect data assets? Are there good ways to distribute risks and align goals when securing information systems? 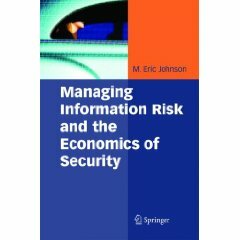 The 2008 Workshop on the Economics of Information Security, the seventh workshop, builds on a strong and growing interdisciplinary tradition, bringing together information technology academics and practitioners with social scientists and business and legal scholars to better understand security and privacy threats. Until recently, research in security and dependability focused almost exclusively on technical factors, rather than incentives. However, we know that economic, behavioral, and legal factors often contribute as much as technology to the dependability of information and information systems. The application of economic analysis to these problems has proven to be an exciting and fruitful area of research. For more information about the workshop's presentations and panels, please see the program schedule. The conference video includes experts discussing cybercrime and protection of digital information. Springer volume highlighting WEIS papers. WEIS 2008 was hosted by the Center for Digital Strategies of the Tuck School of Business at Dartmouth College, in partnership with the Institute for Information Infrastructure Protection (I3P). Measuring malware infections in the Chinese Internet? WEIS 2008: Do data-breach-disclosure laws reduce identity theft? EU advisors: Secure ISPs, form "cyber-NATO"